It's all about sticking it to The Man this week, as we have a look at how professional and amateur artists alike use propaganda elements in their attacks on the powers that be. Not exciting enough? 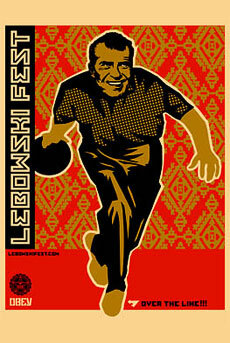 How does Kim Jong-Il in an Adidas track suit or Richard Nixon bowling sound then? Old propaganda material, easily available online, is an excellent source of inspiration for anyone looking to satirize the behaviour of naughty politicians, corrupt regimes and so on. Easily modified, they can be turned into hilarious parodies, a few select of which we'll have a look at this week. 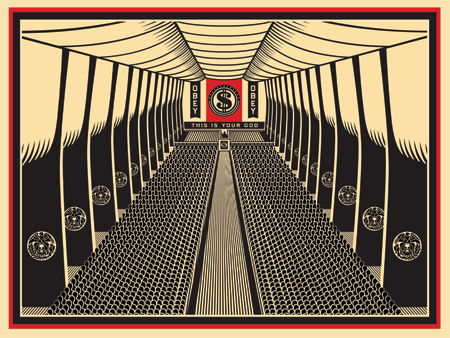 Perhaps even more interesting, we'll have a look at the work of three established artists, Sun Mu out of North Korea, Erró out of Iceland, and Shepard Fairey of the United States, to see how they incorporate propaganda elements in their work. Something of a classic, I seem to remember this one appearing around the time of Bush Jr. and John Kerry facing off in the 2004 presidential elections. 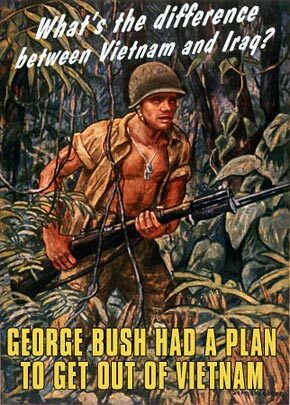 As it turned out, Bush would be re-elected, but contrary to the poster, seemed quite content with pursuing the wars he had running from his first term. 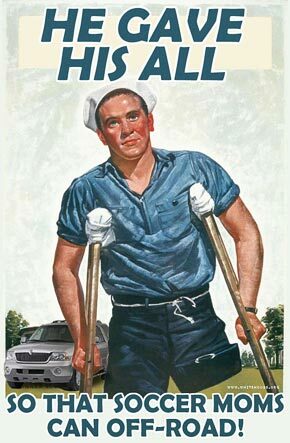 While the imagery looks to be taken from World War II propaganda, the theme of his hilarious poster is reminiscent of old WPA (Work Progress Administration) tourism posters produced during and after the Great Depression, which would promote various areas of interest for Americans planning a vacation at home. 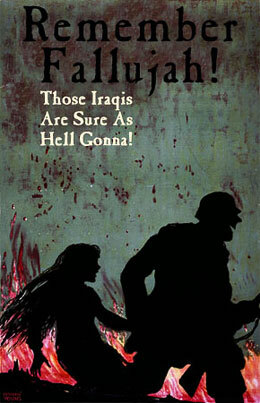 A slightly reworked version of an american WWI poster, originally depicting a german soldier abducting a belgian girl. 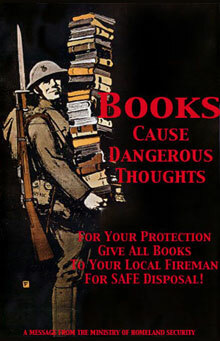 It's one of the more macabre and grim posters I've seen, the original and parody alike. 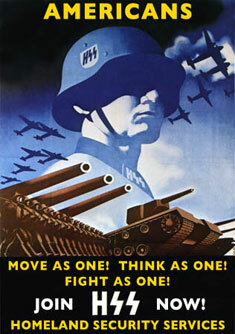 See the original in my earlier post on US propaganda. A spot on take on the farcical negotiations that took place in public ahead of the start of the second gulf war. The US administration would make demands from Iraq, which would eventually be granted, whereupon the administration would either act as if nothing had changed, for instance when inspections failed to uncover signs of WMDs, or make an entirely new demand. As you may remember, the final demand was that Saddam Hussein and his son should leave Iraq, a demand few dictators will consider, since it's the survival of their own regime and their power which they value most highly, not the survival of the country and its people. Is it just me, or does the paratrooper look a lot like Bush Jr.? In any case, I love his facial expression, the confused look of someone who's just woke up in a place he doesn't know. To this day, I'm still at a loss as to the motivations behind the second gulf war. 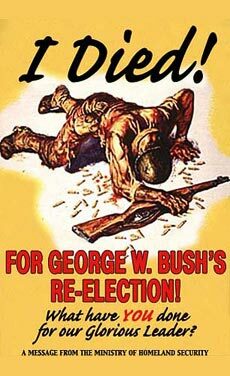 The Bush administration at various times has claimed that it was to combat terrorism, to remove the threat of WMDs and lastly, to liberate the peoples of Iraq. 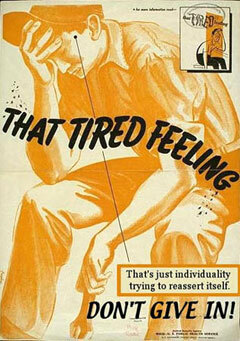 This poster suggests a different motivation, oil. Gaining control of Iraq, with the world's 3rd or 4th greatest oil reserves, would be a big step in the right direction away from dependence on Saudi Arabian oil, away from having to deal with the problematic regime of that country. 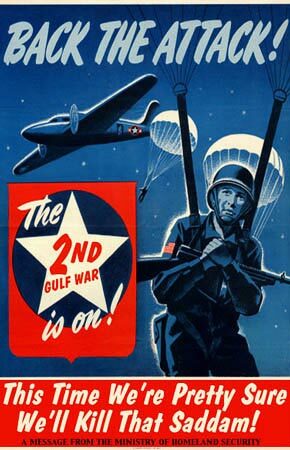 Long before the age of the SUV, the United States fought wars for oil. 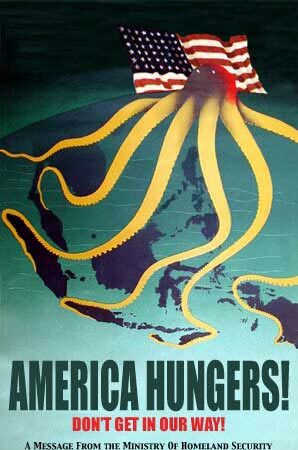 Japan's launch of the Pacific and South-East Asian theatre of WWII was in part a response to a US oil embargo on Japan. Calculations showed that the Japanese would essentially run out of fuel within less than two years unless the country could find alternative oil sources, which was indeed to be found in South-East Asia. The Japanese reckoned that the United States would in any case get involved in that war, so it was decided that the US would have to be knocked out in a great surprise strike. 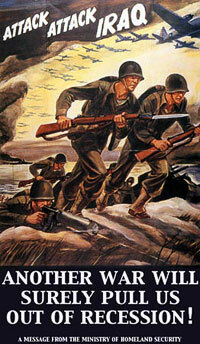 Thus the Pearl Harbor attack came about. 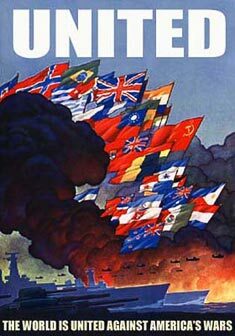 While I haven't seen the original, this looks like a knock off an American WWII poster. The octopus grabbing at South-East Asia from the north would originally have been Japan, which did indeed occupy most of this area during the war. The only change mad then, would be changing the text, and exchanging the imperial Japanese flag for Old Glory. Two lovely, bold posters with a maritime theme, both demonstrating waning support for "Bush's war", presumably the Second Gulf War, since the Afghanistan war had wide suport from the outset. To make them slightly more correct, it might have been wise to remove the flags of the Soviet Union and the (apartheid-era) Union of South Africa, since these are no in existence. Further the flags of Britain, Australia, Romania and Turkey should have been removed, as all participated in some way in the Second Gulf War. Seeing as Canada as of late is pre-occupied with the massively polluting process of extracting oil from tar sands, that might not be such a good solution, Bambi. We now take a break from the mostly amateur parodies you've seen so far, to look at the work of a professional. 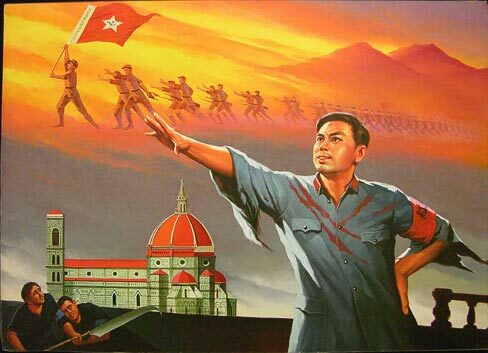 Trained in the social realist tradition of North Korean propaganda poster painting (not unlike the social realist tradition of Communist China), Sun Mu had his work producing propaganda for the North Korean Regime. In 1998, fleeing one of many famines seen in the country, Sun Mu managed to get to South Korea, where he settled and became an artist by his own desire, painting what he wanted, not what he was told. Being a professional artist, his work is naturally of a different breed from the parodies you'll otherwise see in these posts. While the other parodies are without a doubt pointed and funny, the artistic merit is lacking in most. Most are fairly simple "remixes" of previous work, not entirely original stuff painted by a person who has spent years of his life doing nothing else. 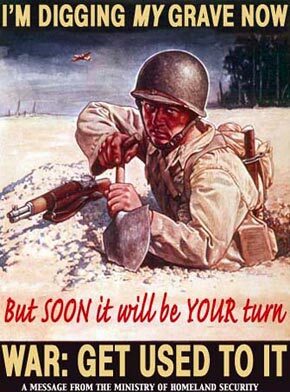 This first image immediately raises the question of whether this could be considered a propaganda parody at all. You have to look hard to notice the North Korean flag in one of the girl's eyes, so it's hard to find the boldness and over-obvious nature in which a theme is usually presented in propaganda posters. And what is the theme? I won't venture a guess, but leave it to people who feel more comfortable interpreting artistic work than I do. In any case, it's a work of sublime beauty, soft shadings, solid contrasts and that little bit of heraldic detail in her one eye to leave you wondering what it's all about. 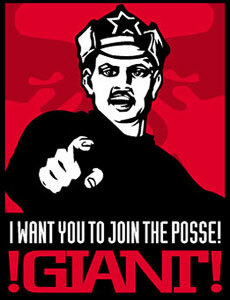 Even less obvious than the first Sun Mu poster, one could be excused to wonder if this has anything to do with a propaganda poster artist at all. 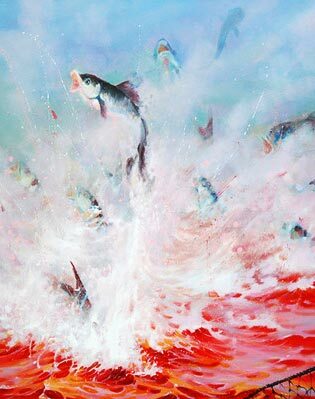 The title of the painting, "Escape 4", in combination with the distinct red colour of the water suggests this painting being related to the closed nature of the North Korean state, a state which essentially keeps its inhabitants under lock within the borders, doing its best to keep anyone from escaping or defecting. Beyond the theme, I included this poster as an illustration of how close Sun Mu's style can sometimes be to what can be seen in our three posts on Chinese propaganda. 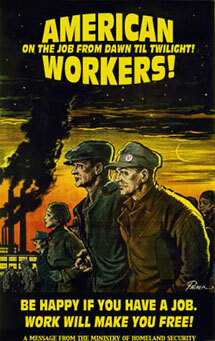 This is social realist propaganda painting at its best. A bizarre and spectacular event known to many outside of North-Korea is the Arirang mass gymnastic games performed at Pyongyang's Rungrado Stadium (the world's largest of its kind), wherein more than 100 000 people perform perfectly choreographed displays of various kinds. This painting looks like it might have been taken out of such an event. But instead of focusing on the whole, on the collective, as a communist regime would, Sun Mu focuses on one girl in amongst the mass. 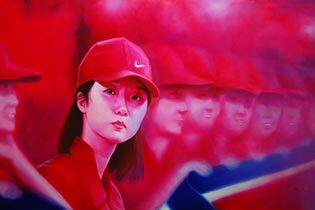 All dressed in red, holding up a big North Korean flag, this girl stands out from the mass of anonymous faces, not behaving like everyone else, nor dressing quite like everyone else, the Nike logo betraying her deviation. An obvious parody, and something which would without doubt have grave consequences for its author, were he still inside North-Korea. 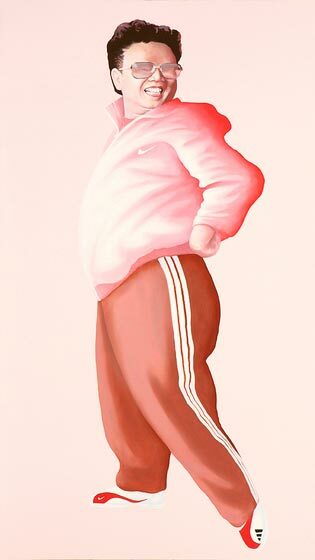 Depicting the undisputed hereditary dictator of North Korea as a silly, fat little man, dressed up in Nike and Adidas, two typical western brands, it's a simple and quite hilarious piece. Notice how he's wearing different shoes on each foot. Again, the theme or motive of the painting is far from obvious. 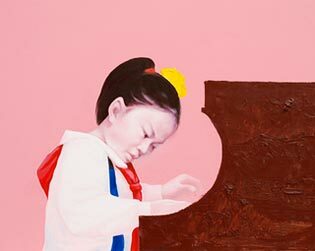 That she's dressed in white, red and blue, the colours of the North-Korean flag, suggests that this isn't just a girl playing a piano, she's doing it under the aegis of the North Korean regime. In a totalitarian regime, I suppose little is done in public that is not in some way arranged by the party. 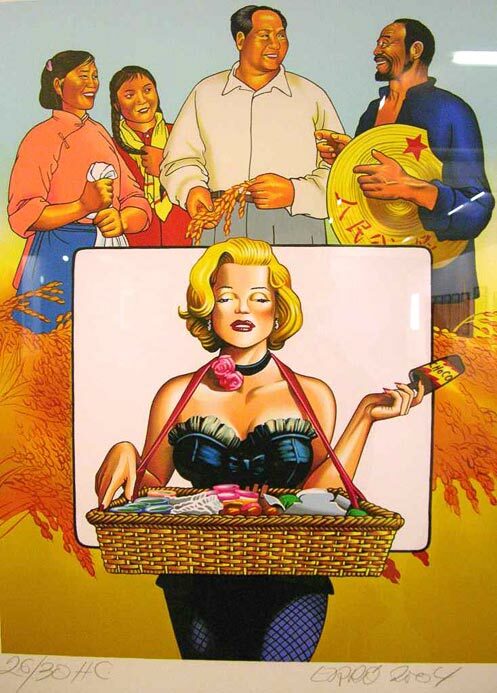 In propaganda posters of the People's Republic, displays of women as anything but burly, man-like workers were practically unheard of until well into the 1980s. If the totalitarian North-Korean regime has anything in common with its more relaxed big brother to the north and east, China, it seems probable that this theme would not have been taken lightly by the regime. Again, we see the presence of the colours and shapes of the North-Korean flag. Leaving Sun Mu's wonderful, thought-provoking artwork, we turn back to the USA, wherein this poster was printed in the year 2003. 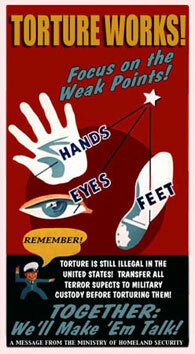 It is in fact not a parody but an original, created by the spooky NSA. 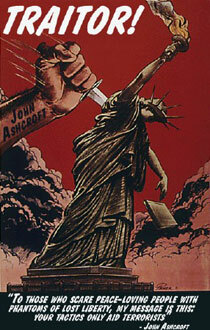 It was posters such as this, coupled with legislation which seemed to point towards an Orwellian big brother society, that inspired many of the parodies seen hereafter. 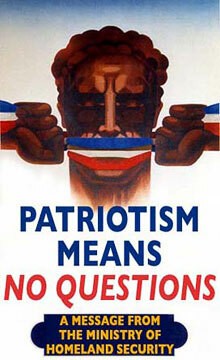 While autocratic/totalitarian regimes such as the Soviet Union, Nazi Germany and the People's Republic printed propaganda posters throughout their entire existence, this is far less usual during peace-time in liberal democracies where the political parties largely present their goals and opinions through the press rather than through a state propaganda machinery. Keeping this in mind, it's worrying when the incumbent regimes of countries such as the US do in fact publish material looking suspiciously like propaganda in peace-time (disregarding the elusive "war on terror"). 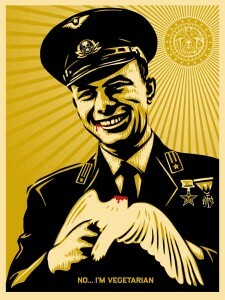 Micah Wright, the man behind the Propaganda Remix Project, made Ashcroft one of the big boogymen in his numerous parodies. Ashcroft was the US Attorney General during Bush Jr's first period and was particularly controversial for his positions and actions on civil liberties. 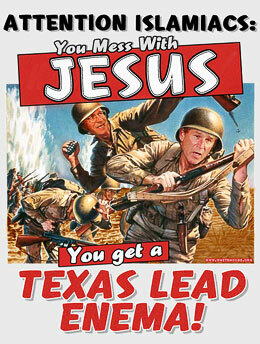 Further, as indicated by the cross in this poster, he is known as a dedicated conservative evangelical christian, and one who was sometimes perceived as mixing his faith with his work. 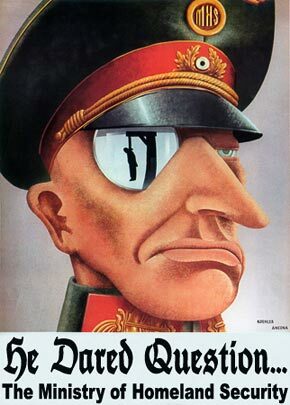 This particular poster is a parody of a superb US WWII poster, the original depicting not John Ashcroft, but a steely german soldier peering at your every move. Whereas the first poster is of American origin, the latter two posters were the product of the Nazi regime, and I find them all the more striking for it. The ability to take material promoting one of the great enemies of the United States in the 20th century and make it look like something the present day US government could publish is a powerful one. That said, it would have been a lot more powerful had it been a bit more believable. 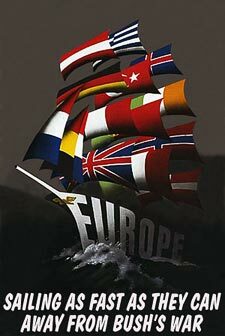 Sure, you can find slight authoritarian tendencies in what the targets of these parodies did, but that's still a long shot from setting up some American version of the SS, ready to conquer Europe. But it stil is damned funny. 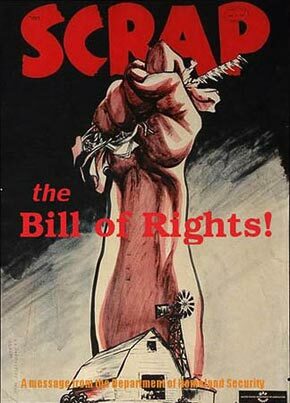 I haven't seen the original poster, but by the looks of it, the scrap which it dealt with was not a part of the US constitution, but proper, real life metal scrap, of farm equipment origin. 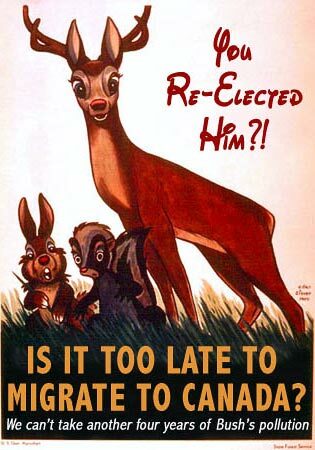 There were heaps of American posters during WWII promoting conservation and recycling of various essential materials, and this looks like one of them. 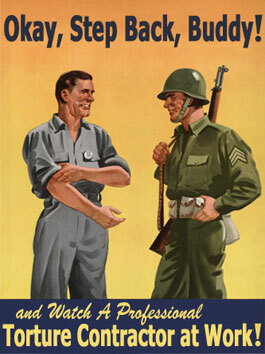 The latter poster ends with a translation of the infamous german phrase "Arbeit macht frei", best known as a slogan on the gates of various nazi concentration camps. While in its origin, a 19th century book by german nationalist Lorenz Diefenbach, there was truth to the phrase, in the camps it was a colossal, grotesque lie. 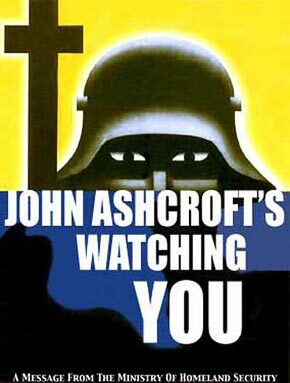 Particularly notable here is the Ashcroft quote in the second poster, which indicates his thoughts on civil liberties, the attitudes in him which scared more liberal people. In various discussions, particularly anonymous ones online, the wording of the second poster will typically be accompanied with suggestions such as "...and go live in North Korea/Iraq/Libya/Europe if you think it's so much better there!" 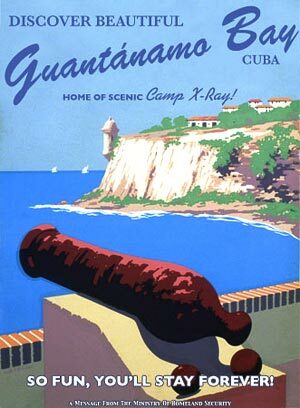 A hilarious parody of a wonderful WPA-era poster promoting Puerto Rico as a tourism destination. Behind the short, strange name we find Guðmundur Guðmundsson, a pop-artist from Iceland, a country known for its proficiency in turning out artists with short strange names. 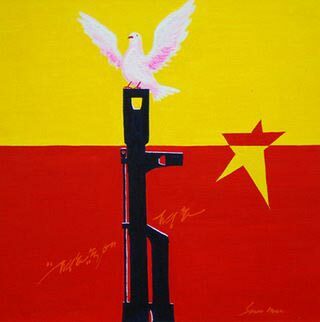 While his output from a long career has been great and varied, of particular interest in this post is his incorporation of Chinese (communist) propaganda in some of his work. 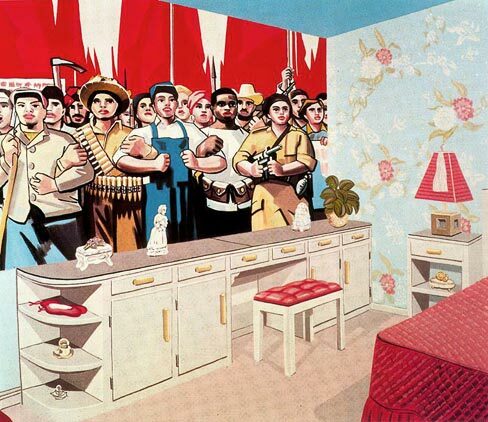 An army of united peasants and laborers, bravely facing an... american bedroom apparently. 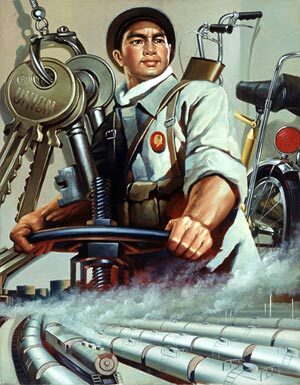 It's the classic chinese poster of world communist solidarity, hard as rock, mashed with an delightfully gentle bedroom. A scary view to wake up to in the morning, and if the classic action movie Red Dawn is anything to go by, a realistic, perhaps even likely scenario during the Cold War. Due to the recent origin of this piece (made 2006-2007), I wonder if this could perhaps be some sort of comment on the issue of bio fuels? 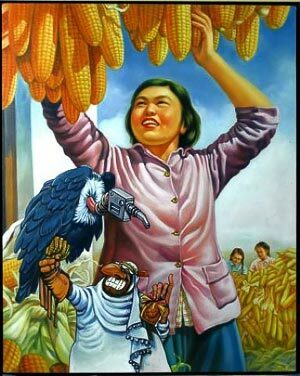 It's a mix of a typical chinese poster celebrating another bumper harvest, and some cartoonish arab oil sheikh character with an oil-pump-vulture on his arm. 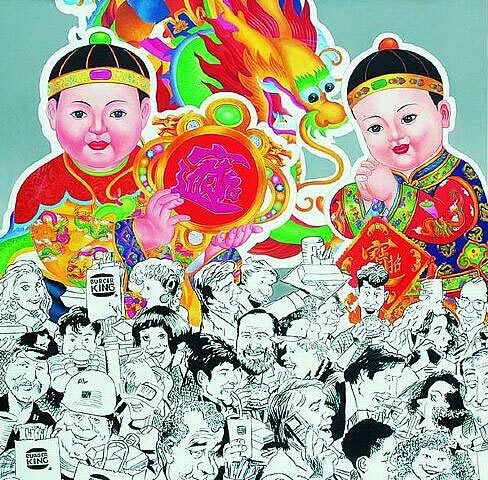 As seen in the third part of series of Chinese propaganda, fat, happy babies are an important theme in Chinese poster production. Their fatness will hardly be hurt by a steady regimen of Burger King fare. 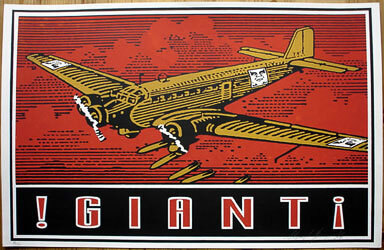 The classic OBEY Giant used to be Fairey's best known piece, by far, though its fame has by now been greatly surpassed by another work you'll see in this post. 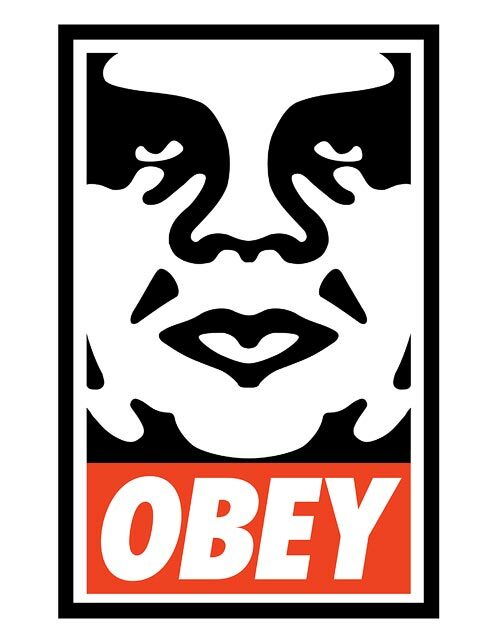 The OBEY Giant is based on Fairey's 1986 "André the Giant has a Posse" sticker, an underground phenomenon that was widely distributed, popping up glued to surfaces all over the world. It depicted French wrestler André ("the Giant") Roussimoff, a huge french wrestler. His likeness was heavily stylized and turned into the icon you see here. 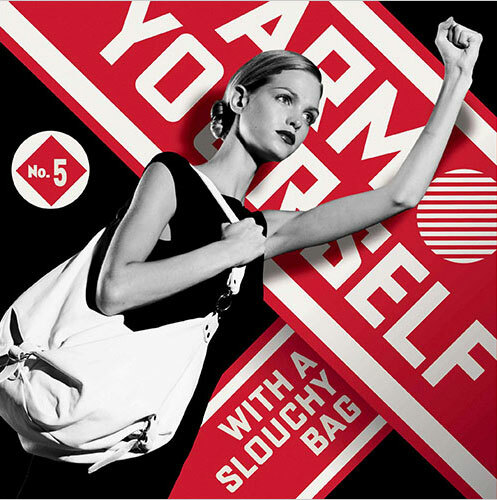 Created earlier this year for New York department store Saks Fifth Avenue, it resulted in a fair bit of criticism towards Fairey, as creating advertising artwork wasn't seen as good form from a rebellious underground artist like he's supposed to be. Styled like something out of Soviet constructivist propaganda, its got a message to match, only it's not promoting love driving the collective tractor or support for the Revolution, but rather demanding you Cherish a romantic blouse! I don't care whether Fairey is a sellout or not, this here is some of the coolest, funniest advertising artwork I've seen. 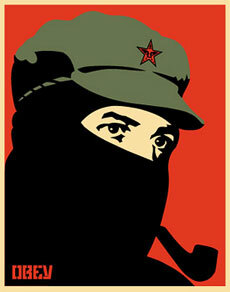 By the looks of it, this is the enigmatic subcommandante Marcos, famous spokesman of the Zapatista revolutionaries of Mexico's Chiapas state. He's a hero of a wide spectrum of left-leaning radicals, an icon of anti-globalization and anti-capitalist movements world wide. He's always seen wearing a mask, typically accompanied by a pipe, and travels with a deformed rooster named "El Pingüino" for a companion. Do these images suggest support for Marcos and his cause, or do they suggest that he's just another power hungry cynic, using a deceptive charisma to garner support? Fairey tends to be oblique on the meaning of his less-than-obvious work, typically suggesting the viewer should think for themselves, that the artwork itself does not lean one way or the other. While much of Fairey's work, such as the Marcos posters earlier, can be less than crystal clear in its message, I'd say the two posters above are obvious enough in their irony. 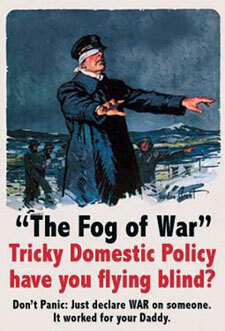 As we'll se later, more would come from Fairey to counter Bush, or perhaps more precisely, his legacy. A Junkers Ju 52 bomber. Nice. 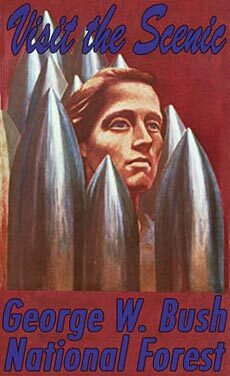 If you're thinking Fairey's OBEY message is not to be taking literally, you're quite right, as illustrated by this poster. Flanking the mighty dollar are two great OBEY streamers, in front of a huge mass of uniform beings, as if taken straight out of some Orwellian totalitarian nightmare. 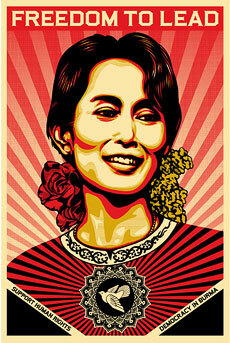 Putting these together was my own choice, not Fairey's; the contrasts are striking between the somewhat villainous Nixon (bowling) and the next-generation Mandela, Burmese democracy activist and political prisoner, Aung San Suu Kyi. 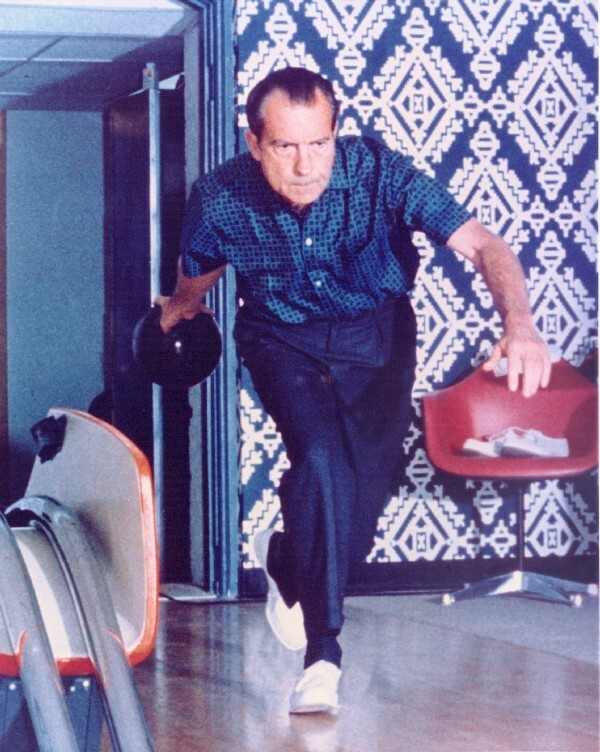 The Nixon poster is based on a famous 1970 photo, though the original shows a more concentrated president in action. You've seen this before. 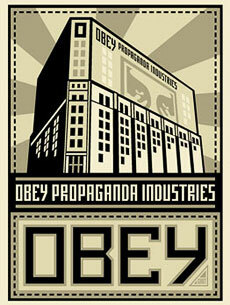 Fairey's second famous work, the first being the OBEY Giant icon, is without a doubt the one best known. Hundreds of thousands of parodies and remixed versions have been made, if not more. 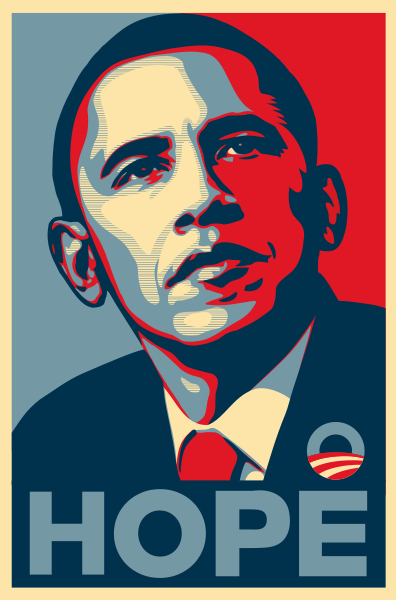 If you're not tired with the phenomenon by now, there's an Obamicon Generator available to turn images of yourself, your family and a package of sausages into bold proclamations of hope (or anguish). Come back soon for the second installment, which will takes a less political tone, but will be ridiculously fun nonetheless. 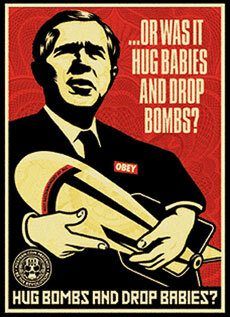 Obey Giant - Shepard Fairey's website, complete with a giant gallery of his work. 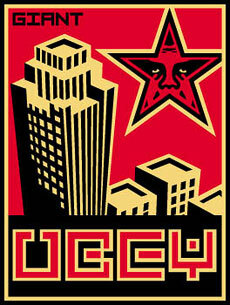 The Propaganda Remix Project- The origin of a great many of the old remixed posters seen here, all done by Micah Wright. Wright has authored three books, brim full of his best remix material. 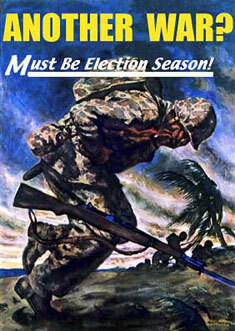 Worth1000.com Propaganda contests- Worth1000's string of propaganda photoshop contests is a great place to check out all sorts of twists made on old propaganda material. Use the drop-down box on the left to navigate between the various contests. 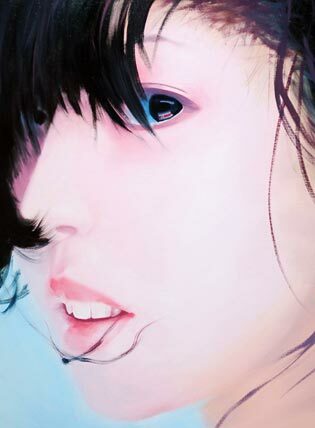 Sun Mu's blog - See more of Sun Mu's peculiar artwork at his blog.It's written in Korean, but his imagery transcends that. The White House - Not the official White House website, but rather one dedicated to allsorts of satire and humour on George W. Bush's expense, including aconsiderable collection of "Patriotic posters". 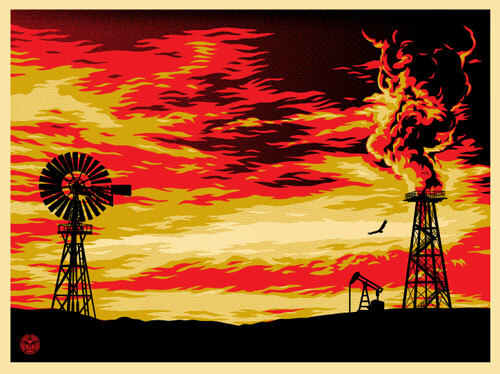 I think this artist should now add on with Bush passing the torch to Obama and have the torch going to light Iran on fire. It seems as though we have all be duped by both political parties. 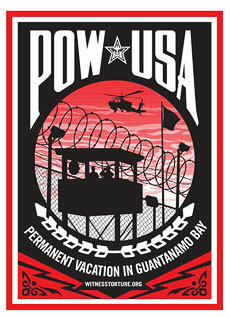 Obama continues the same Bush policies, Gitmo - still open, Iraq - still troops, Iran - still no negotiations and economically it is even worse. When will people begin to realize that it doesn't matter the political party, the American Tax Payer/citizen will always get the short end of the stick! 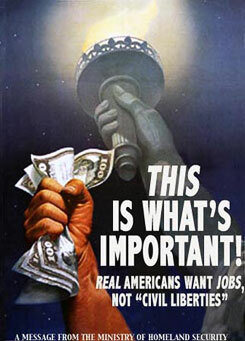 Audit the Fed should be 1 poster! We are spending too much $$, our children are being born into debt and it just isn't Bush's fault either! It's 25 years of unaccountability! Term Limits should be another poster! 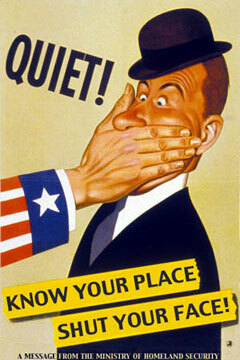 Wake Up America your losing your rights and the Consitution is being used as toilet paper or worse! AUDIT THE FED! AUDIT THE FED AUDIT THE FED! AUDIT THE FED! you people make me grin. You support the messiah Obama without seeing how he's putting this country into a debt never imagined before. He is the plauge of the middle and working class he expects us to all give a litte more while he funds pet projects and banks and failing motor car compainies and then shits on the middle and working classes while winking at us.He makes me sick , I hope you'll all be happy when this country implodes. News Flash: Bush is no longer President! It's July 2009, folks! Bush has not been POTUS since January. It's time to move on. These posters are no longer relevant (not that they ever were!) 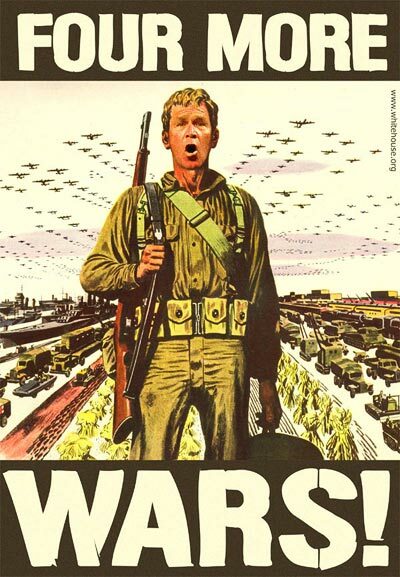 It's time to get treatment for your Bush Derangement Syndrome and move on. 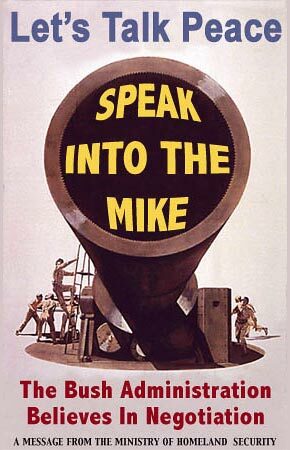 You're starting to sound like WWII era old men grousing about that g-d Frankie Roosevelt! Hey Antoine! In case you weren't affected, many of us lost our jobs, homes, retirements, helathcare, do i need to continue. The village idiot IS no longer in the white house, but the death and destruction he left here in the united states is a higher price than the taliban will ever have to pay! This tells me that Leftists and liberals are all about hate and childish superficiality. They once talked about MOVING ON. They still are stuck on Bush. I can't believe there's no "Selected, Not Elected" dreck up there. You guys should be talking about how great Obama is (supposedly), but you're still going on with the same crap. I can't wait to see you under President Palin. You might have to be admitted to a rubber room. 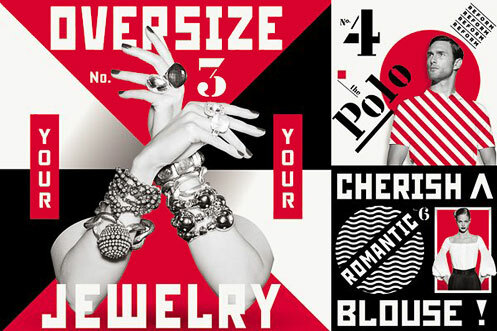 "The origin of a great many of the old remixed posters seen here, all done by Micah Wright. " Micah Wright, of the "Propaganda Remix Project," claimed to be a U.S. Army Ranger and combat veteran, in order to bolster the credibility of and lend moral authority to his propaganda and position on the war. Wright was later exposed as a liar, who never even served in the military. 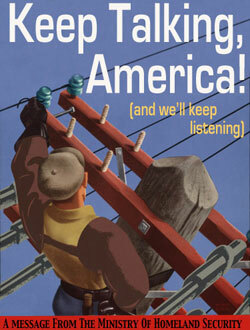 The selection of American propaganda posters is very one-sided. 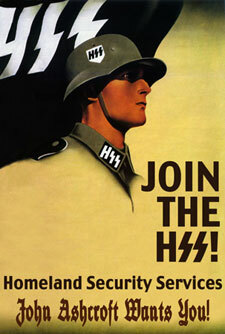 How about more stuff like http://img31.imageshack.us/img31/5663/banfascism.jpg (via http://girlinshortshorts.blogspot.com/ ) to balance things out? The opening sentence of this web page states "It's all about sticking it to The Man this week." 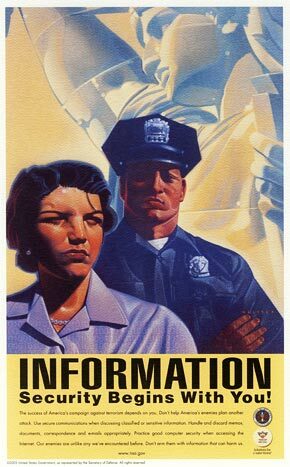 Question authority, but not ours. Hate the man, but we're not him, eh? We recognized, once again, that we can't love our country and hate our government.